Bukit Timah Market and Food Centre closing for 2 months. If you have been having your meals at the Bukit Timah Food Centre, you would have heard it from the hawkers for some time now. 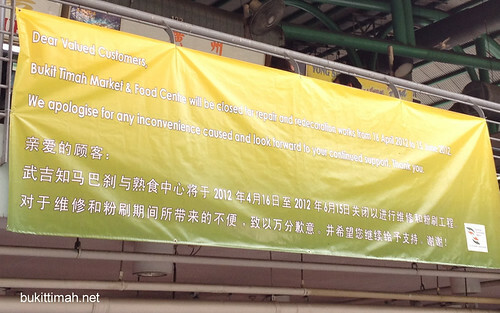 The Bukit Timah Market and Food Centre will be closed for 2 months. The authorities will be renovating it. The market will be closed from 16 April to 15 June 2012. Hey, any idea if any of the stalls were relocated? Am missing Seng Kee Carrot Cake already. Not very sure. It seems like they are taking a break. For some stalls, they have branches elsewhere, eg the HK Soups. You can visit them at the other branches. Not so sure about the Carrot Cakes though. Haha, thanks! I live at Toh Tuck and the market to be honest doesn’t have a lot of foods I like as compared to Beauty World and the stretch where Al Ameen is. However, I do miss the Carrot Cake (middle stall, the “apprentice” of the original carrot cake uncle although the corner one is technically the descendant), Fish Soup, and their occasional BBQ Seafood. Hi, any idea if the Bt Timah food centre is re-open now?